With nearly all roads around the world being asphalt based, it is nearly impossible to not need a product like CarPro’s Tar X Tar & Adhesive Remover. While darker colors do a great job of hiding tar spots, lighter colors such as white or silver show specks of tar very easily. 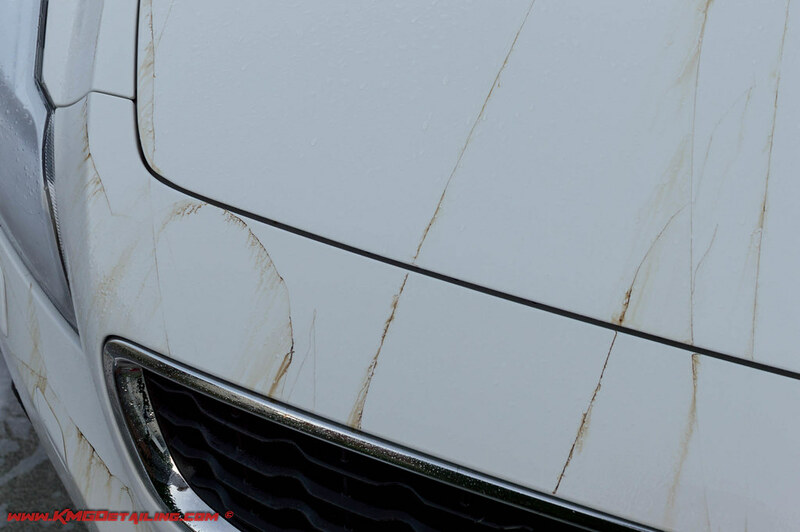 Typical washing products will simply not do a good job of removing these marks in a safe timely manner, and that is where Tar-X comes in. This product really needs very little explanation as the name does a great job of describing what it does. As with all my reviews, here is the product description as provided on Detailed Image’s website. The CarPro Tar X Tar and Adhesive Remover is far more than an ordinary degreaser so don’t underestimate just how amazing this product is. It’s a very strong yet relatively gentle product that can quickly remove not only tar but also asphalt, bug smear, tire marks, stubborn adhesives, road grime, brake dust and so much more. When you spray it on tar you can literally see the tar start to dissolve within seconds which saves you from scrubbing with too much arm pressure or using aggressive clay bar treatments. To explain why this formula is so advanced we’ll start off with how it’s made. Tar X utilizes all of it’s cleaning power from the solvents extracted from orange peels, which contain no chlorinated solvents or harsh chemicals so it’s non corrosive. The number one ingredient in many cleaning product is actually water or fillers but Tar X boasts 60% active ingredients and a thicker viscosity that clings to the paint and won’t run as fast. Another original characteristic is the “glow color tracer” which you have to almost see to fully believe. When you spray it on the paint it leaves a neon green glow on the paint so you can see exactly where you have sprayed. In fact, this neon glow will quite literally glow in the dark if you use it at night, but it rinses clean with just a quick spray from the hose. To apply it just spray it on the paint and wait about 1 – 2 minutes before rinsing it off or for stubborn buildups agitate with a soft sponge and rinse clean afterward. During use avoid direct sun and don’t leave it on the exterior for more than 7 – 10 minutes, especially plastic parts. The only other precautions for the vehicle is to not use it on acrylic paints and work in a ventilated area. It’s safe on fresh paint, vinyl films, chrome trim, vinyl/plastic trim, etc., again just don’t leave it on excessively or dry up. After you apply it you’ll be amazed at how much this formula can remove from the exterior because the tar literally melts away where as many other formulas just soften it up at best. Please remember despite the strong cleaning power you are using a citrus based cleaning product that is non corrosive. If you choose to follow up with a clay bar you will have saved yourself a lot of time and the now clean surface will enhance the results of any polish, glaze, sealant or wax used afterward. The CarPro Tar X is truly an incredible product that is going to save you time and improve your results so pick some up today! 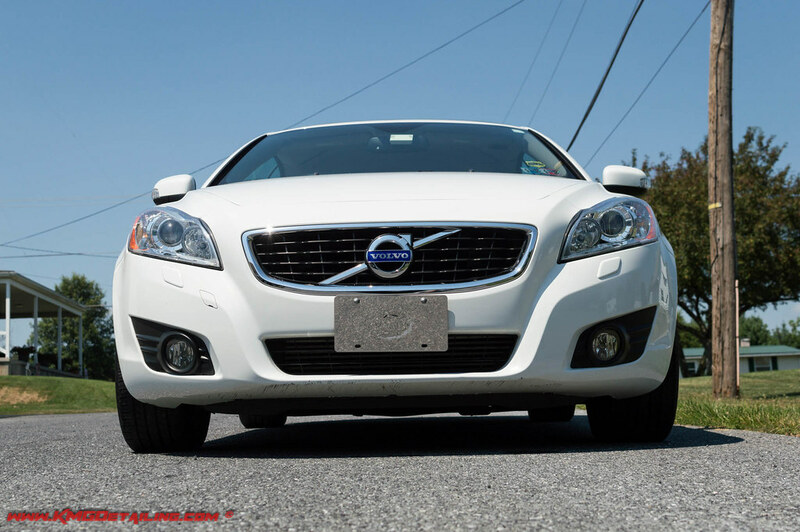 I recently had a Volvo C70 come in that had quite a bit of tar on it after following a construction vehicle on the highway. This was a great vehicle to show the abilities of Tar-X. You can see the thin strings of tar running up over the hood and front bumper cover. The entire car had streaks of tar like this from front to back going up over the roof. 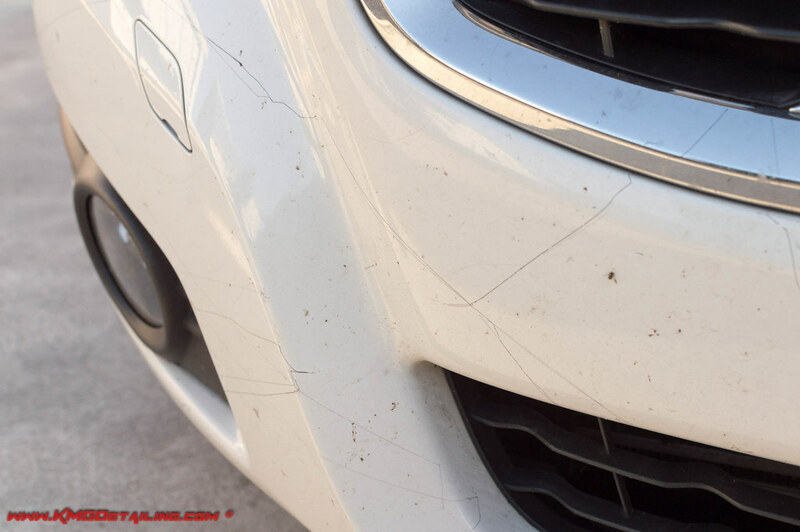 Another picture of the front bumper cover showing a close view of the tar, along with quite a large buildup of bugs and other debris. The directions for using CarPro Tar-X are quite simple and listed directly on the label of the bottle. Shake well, spray on dry surface. Let react 2-3 min. or brush/wipe on surface. Avoid leaving on for more than 7 ~ 10 min. Avoid spraying on acrylic paint. Rinse well with water or power wash.
For the removal of the tar I sprayed a generous amount of Tar-X on the affected areas and let the product sit and begin to work. After a few minutes of breaking down the tar buildup, I used the Tuf Shine Scrub-All No Scratch Sponge from my wash bucket with Chemical Guys Citrus Wash to gently scrub the areas. Some of the streaks required more than one application to be fully removed. Following the use of Tar-X on all the affected areas, the vehicle was washed using the 2 bucket method prior to being treated with Iron-X for the final step of the chemical decontamination process. After being chemically decon’d, the surface was washed one final time using the Nanoskin Autoscrub Fine Wash Mitt. The surface at this point was clean and free of Tar and bugs. Once the exterior was clean it received a quick polish using my Griot’s The Boss G21 and Optimum Hyper Polish to boost the gloss prior to being sealed with Carpro Hydr02. 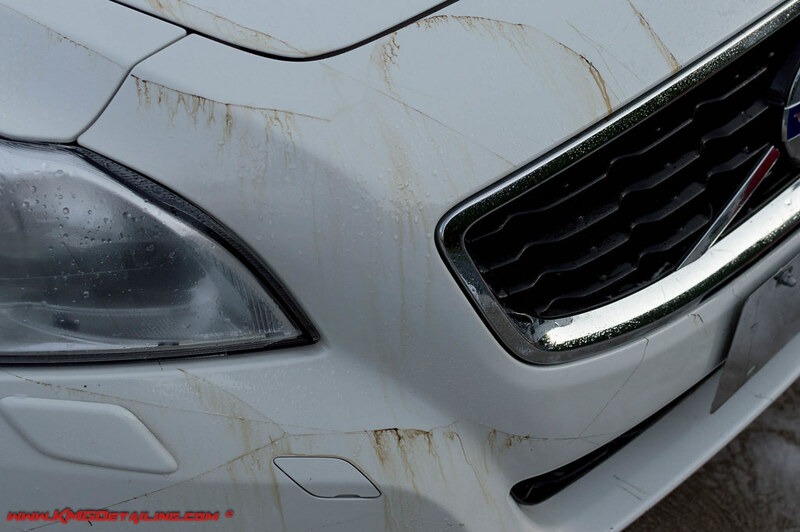 Without a product like Tar-X it would have been quite difficult to provide a spotless white vehicle as pictured above in a reasonable amount of time. So if you have problems with removing tar from the surface of your vehicle, this is a product you should not be without. How would you compare this product to stoner tarminator? Does it perform similar, worse, or better than stoner tarminator? Also if the paint already has a paint coating on it like 22ple, Opti, etc will it compromise the durability of the coating and will this product also work on tree sap? James, I have not personally used tarminator, however in discussion with other who have used both they would work very similar. As far as using this product over a coating you should have no issues with using this type of product on a coated car. 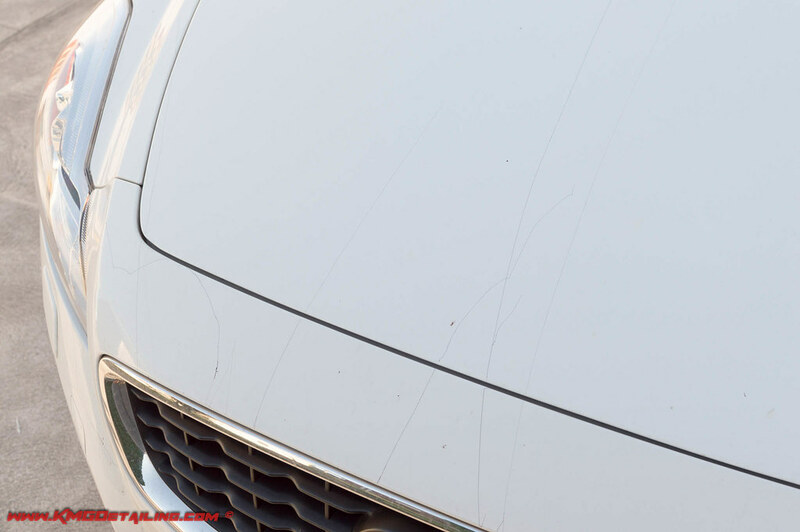 One of the added benefits of a coating is high dirt release, meaning it should be easy enough to simply remove most debris or dirt on the surface during your normal wash process. I do believe this would also work on tree sap. Does a brand new vehicle which is picked from dealership needs Tar X ? 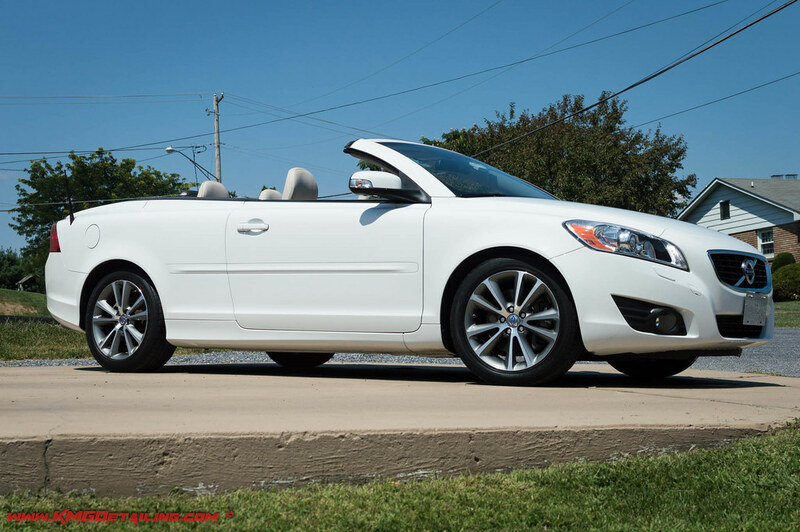 I will be receiving my new car shortly, planning to apply sealent the same day. But should i hv to use Tar X prior to wax/sealent for such a new car? Sam, your new car would only need tar-x if there was tar or residue present on the surface of the vehicle. I would recommend using some Iron-X on the vehicle however. Are you having the dealer prep the vehicle prior to taking delivery? Thanks for the reply kevin. Yes, i will be using iron X . I dont think it will have tar , since its a new car. The dealership only wash. They wont detail it. In your opinion, should i clay bar the new car ? Or iron X more than enough prior to sealent ? Sam, it really depends on how far you intend to go with thing. I would recommend that you clay the car though. It is possible that you could have residue on the paint from shipping wrap also, which if that is the case then you could need Tar-X. Typically to prep a new car you would want to wash, decon (Iron-x followed by clay or nanoskin) and then proceed to a light polish of the exterior (or more if needed). At this point you can put your final protection on. You don’t NEED to polish the vehicle but if you want to have it looking its best you should. Thanks for the advice kevin. But Isnt iron X enough for a new car. ? Heard it will take care of 80℅ contaminates and rest 20% only the clay bar has to work for. So shud i risk of marring the paint for that 20%? And i dont have a machine polisher if at all i mar the paint. One more doubt, Do i hv to always polish the car after clay baring? Sam, it all depends on how far you want to go with things. Personally I don’t clay a car unless I am going to at least do a light polish on it. So since you don’t have and don’t plan to polish it you could likely skip the claying part. What type of car is it and what color? Bcoz machine polisher and pads costs a lot here. And i wud be detailing my car may be thrice a year. So to spent a lot on a DA policer for DIY setup for a single car , i thot better not to buy. Its a suzuki baleno 2016 model” Ray Blue “colour. All orders from you have processed same day and arrived almost all next day. I am positively thrilled at your speed and accuracy and care in packing.